Focused on education and training, Blackboard Collaborate is designed for simplicity, accessibility and to support education and training workflows. 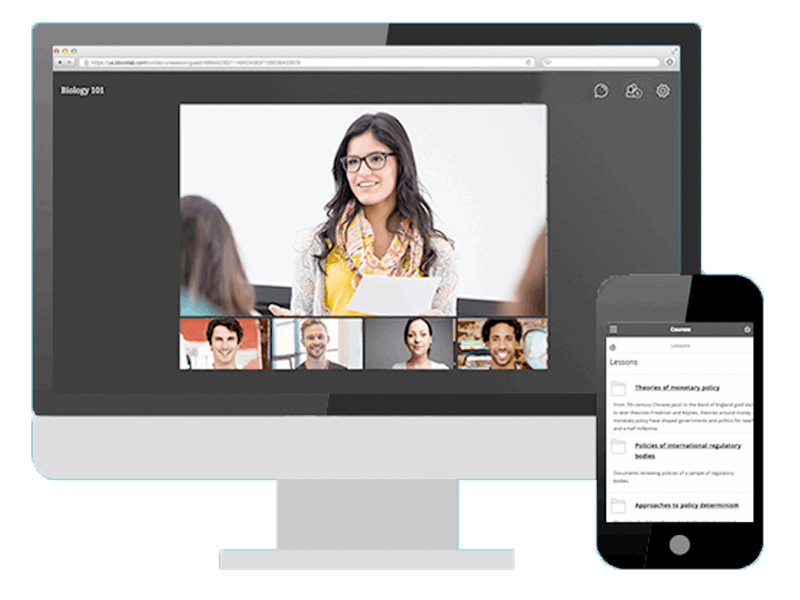 Whether it's an online meeting, virtual group training, or connecting remote employees, our one-click virtual training solution offers a level of connection and engagement that makes learners forget that they're not in a physical space. Blackboard Collaborate Reviews Recently Reviewed! Overall: Pleased with my experiences with Blackboard. It's incredible that you are able to take virtual classes with this platform. Pros: Blackboard Collaborate is such a great option for online teachers. We use it to meet with students and present lessons live on the computer. I use it weekly. It is seamlessly integrated with PowerPoint. The features are neat - you have lots of controls as a moderator. You can allow students to speak, use video cameras, type, draw, add pictures to the whiteboard, etc. You can set how many students can be speaking at once. You can mute them by taking away tools. You can create breakout rooms. You can play all sorts of media. You can remove students who are not behaving. You can lock the room or allow attendees in late. I've met with anywhere from 1 to 700 participants. You can make permanent forcing slides and make sure that students can't do anything without a teacher being present, but there are downsides to those functionalities as well. The app is really great. It is limited, and simple, but I've never had a problem with it. Cons: The major thing I dislike is the "exception error" that I get CONSTANTLY. Basically, BBC can only handle so much data. Because it can't tell which participant needs what, it actually has to save and stream anything within a certain time period and send that out to everyone in the room. So, it really bogs the room down. It is just saving a TON of data at any given time. We've had to create separate rooms for back to back sessions instead of hosting them in the same room for this reason. It'll give an exception error if you try to do too much with too many people in too small a timeframe. Don't try to host a session over a wireless hotspot unless you have unlimited data. One session cost me like 2 gigs of data. Recording can only be done in the main room. If you need to record in a breakout session, you'll have to figure something else out. We use Snagit for breakout room recordings. The administrator panel is very confusing. I'm really tech savvy and I have a hard time navigating. It is definitely not intuitive when it comes to setting up new rooms and adding moderators. The permanent forcing slides are good. No issues there. However, what a pain to set up -- it just makes no sense. I wish it was easier to figure out how to do that. Recommendations to other buyers: We've tried several and BBC seems to be the best. With any product, there is no such thing as perfect. I've had experience with 3 different presentation softwares and the other one I liked was Elluminate. Blackboard Collaborate is a good one but I wish it could handle more data. Consider: cost, how many attendees you'll have, how often you'll use it, and what support you'll have. Pros: As a student the software is easy to use and has an easy to use dashboard. It is nice to be able to email other students or teachers, especially when you get to the university level. I like how there are different options to view your grades and when you submit your assignments there is a confirmation code that is generated. There is also a variety of tools besides email in which communication can take place, like discussion boards, videos, or links to other websites. I also found it handy to keep track of important announcements from campus organizations and professors. As an Administrator I like how the software can keep me organized and track the progress of the students. Cons: I did not have many issues as a student, but as an administrator I found a few places with room for improvement. At times it was difficult to upload assignments, I would always get an error message. I know I am completing the correct steps because I have uploaded many assignments. Another issue I had was that this software always seemed to go down at the most in opportune times, like right before finals and then an extension had to be given to the students to be fair. I can't say if it was the fault of the school or the software, all I know is it is frustrating. Overall: I like Blackboard as a learning platform. I do think, like all software, a few bugs need to be worked out for better administration. Maybe a face-lift would be nice as well. Pros: You knew that everything you needed was on this one site. For people that may not be as organized or good at remembering dates, this is perfect because it is available to you whenever you need it. If you, (like me) lose important sheets like the syllabus which has EVERYTHING you need to know on it, you can just go to blackboard, that particular class, and upload a copy wherever you are and whenever you need it. Cons: Although the site is set up for success, it is user dependent on its' success. I have experienced professors who set up their particular blackboard site to be confusing and disorganized, so that you feel unless you have clicked on every possible tab, you may miss something that is due. It takes a lot of time and is a lot to do on top of the normal agenda with multiple other classes. Perhaps a future edition can create a more structured platform for professors so they are guided more when setting up their particular course. Overall: Blackboard allows me to work the job I want to work so that I can still get my education at night. I can access and achieve the same things as students going to school during the day, while I am earning a living. For any short-comings the site may have, it has double the benefits. Pros: Everything you needed for the course could be found under its heading, so you always had access to your syllabus and course requirements. It allows the unconventional student to be equipped with everything they need to still learn outside of the classroom - at the convenience of their own time. Cons: Just because all the information is provided does not mean you are automatically organized - toggling between tabs creates the possibility of potentially missing an assignment, as blackboard does not alert you when something is due. therefore, if you happen to skip over a tab in the class you may also be skipping over an assignment. Overall: I have completed several courses both in class and online through blackboard and have minimal negative comments. I have taken it for math, science, and even art courses and each were fairly easy to navigate. Having electronic copies of important documents, like the syllabus, is invaluable because it is always accessible for your reference. The more you use it, the easier it becomes to navigate. Pros: I enjoyed using Blackboard as a student of a local community college. I found that it was really easy to use and one of the best programs I had ever encountered! It was so important to me to be able to learn not only in class, but also at home. Being that I had not been in classes in some time it sometimes took me longer than my classmates to understand, and learn things. I was able to use Blackboard at home and they had many different activities that would help you get extra practice from flashcards, quizzes and labs that you could use to help you better understand the curriculum that was being taught that day! Overall: I liked using Blackboard being able to stay on top of all my grades while staying on top of my assignments is a huge help. Thanks to Blackboard it has made me be a better student. Pros: I used this platform while in college. All of our classes were accessible in one place and we had access to teachers/classmates at all times. Could ask questions and get immediate responses. Could submit papers/assignments so you never had to worry about your dog eating it (). Calendar kept you organized on due dates and class material. Grades on classwork/tests were easily accessible at all times. Pros: The thing I like about blackboard is the ability to download app onto phone and easily navigate through messages, discussion post, new grades submitted.. the list goes on. Blackboard has taken in the evolving approach in technology implemented into this software. You can modify, add or dismiss what you don't want shown. Blackboard if your platform and can customise it as you wish to fit your need. It is very user friendly. Cons: I don't think there's anything I dislike about this software. Perhaps the one thing I like least about this software is not being able to view attempted assessments via the phone application. It will direct you to use your desktop browser to view details. Pros: I like the ease and setup of the course in blackboard. The layout is super-friendly in terms of finding your course materials, your email, instructor information, or accessing discussion boards. As a student in different schools, I found blackboard worked pretty much the same way, no issues in attending my live class sessions or taking my tests. Cons: No cons regarding blackboard from a student's stance. It is really laid out where anyone can log in and find their way around after a brief tutorial. Overall: I have used Blackboard across the years in different educational facilities as an online student. It has been non-problematic and I've achieved to college degrees and would recommend to anyone looking to set-up a learning environment. Pros: I really liked using blackboard for all of my classes. It was an easy website or app to go to everyday to check my grade and assignments that are due. It made it easy for me to contact teachers when needed. Cons: I don't love the set up of the website when you log in. It takes some getting used to to fully understand it. I also didn't like how it showed all the classes i took in past semesters first so i had to go to the bottom of the page to find the classes I'm currently enrolled in. Overall: Overall i like using blackboard because it helps me keep all my classes and assignment in one program which is really helpful. And all my grades are shown for each class. Pros: Lots of useful features for professors and students that makes online learning feel more personal. Instant messaging works well and the interactive whiteboard is indispensable. It's a nice touch that it's browser-based, so there's no need for students to download a desktop version as it can be accessed anywhere. Students seems to benefit from the instant interaction with the teacher with the two-way webcam capabilities. Uploading files, slides, and videos is smooth and useful. Cons: All features are hard to realise if you don't have a lot of IT resources or experience. Students should be able to record private sessions/breakout rooms. Sometimes students find that the more people in attendance, the more instance of freezing and errors. Some students have also mentioned issues interacting with the MacBooks. Tablet/mobile capability could also be tweaked as the interactive whiteboard seems to have issues on these platforms. Pros: Seeing grades posted throughout the semester, referencing resources that teachers posted, and taking quizzes and tests on it. I also appreciated that they worked with group projects to connect with other students in the class and to upload assignments. Cons: It would crash every so often, not enough to make a huge deal about it. Overall: I used blackboard as a student. I always liked when a teacher would use blackboard to upload assignment, post grades, have PowerPoints available, and even when test and quizzes there. Blackboard is a must for a modern learning work environment. Pros: The most important part of this program is its web conferencing feature ,which gives us access to functionalities needed to support a modern teaching and learning work environment, such as 2 way VoIP, built-in phone conferencing,multi-point video,rich media ,mobile collaboration , interactive whiteboard, application and desktop sharing, breakout rooms, and session recording. Cons: Blackboard is restrictive in terms of the file formats, we are able to play. Also there is the tendency for text boxes and some dialogue components within the Blackboard framework to suddenly malfunction. Pros: The software is very detailed. There are many part to one action, you can control everything you need to. It is easy to learn, which i have had to do. But also it is easy to learn and study on your own. The outcome results for example as on a register, is also detailed and self explanatory. Cons: It is an older system. I think it needs to be updated where there is not so much room for error. It is very 90s set up. Cons: - File formats were limited in terms of what types of files could be hosted/played. - Blackboard would, on occasion, crash and cause me to relaunch the site. Not a huge deal as it didn't happen that often. Pros: I love that the "receiver" (in our case, the student who is meeting a tutor or academic coach online for a video session) doesn't have to download an app or program or even create an account or log-in. They can access a session through their browser using the link we send. This saves a lot of tech issues or the student having to make an account to access other options like Hangouts, Skype, FaceTime, etc. Cons: Some of the features aren't easy to find. It could be more intuitively designed. There are help guides, but I have often thought that many features should be obvious and easy to find and not require the use of the Help section. Overall: We use this program in the Student Success Center for hosting online sessions (including live video interaction) for our tutoring and academic coaching services. We sometimes record a session for later use in training or for student reference. I have used it to conduct and record interviews for research purposes, as well. Pros: I used this software when I taught business courses for Ashford University. It was incredibly easy to use and I was able to upload video as well as the text for each chapter of the book. Once you have put all the work into setting up your course it is super simple to duplicate. Cons: Every once in a while a student would have trouble uploading their paper or assignment to blackboard, however this was an easy fix with a call to support. Every time I called support they were able to quickly resolve the issue the first time I called. Pros: Ease of use and integration into Blackboard courses with the additional capability of use outside of the LMS. The ability to hold virtual meetings for business as well as academics is great. Our instructors love using Collaborate for virtual office hours and our HR department uses it for job interviews and board meetings. Great program. Cons: The compatibility with browsers other than Chrome has caused issues for faculty in the past. It is our understanding that Collaborate is made specifically for Chrome, which is not everyone's browser of choice. Overall: The ability to hold virtual meetings for business as well as academics is great. Our instructors love using Collaborate for virtual office hours and our HR department uses it for job interviews and board meetings. Great program. Cons: Administratively it can be difficult to find how to adjust the settings and launch things using the software. It can take multiple steps to do something that should be easily handled. Pros: This software is easy to utilize within an organization. It offers the opportunity to collaborate with others, go into private discussion rooms, and do instruction. Cons: Crashes at moments and does not opporate all the time as expected. Overall: One has taken instruction on the Blackboard platform, turned in assigments for both work and education, and collaborated on work projects. Great tool for college classes. Pros: There is so much to keep track of with classes, assignments, grades, etc. and blackboard lets everything stay in one place so students and teachers aren't spending too much time just locating items. Cons: It can be a little glitchy at times but overall, the pros greatly outweigh the cons for blackboard as a student. Overall: Saved time and effort during a busy college life. Pros: I have used Blackboard for years as a college student. It has a lot of great features, like built-in messaging and grading scales, that make it easy for students to communicate with professers and understand course requirements. Cons: Blackboard is not the most intuitive, and it takes a while to get the hang of. Pros: I enjoy to preparer the scenario previously and while the students login to the platform, I chat with them: "Hey, welcome" and I invite them to change their profile, after that, I share with them my PowerPoint files or I give them the guideline to share their files. To assign or change the session-role with the students has been a great experience: let them drive the class and expose their jobs from their device, sharing their desktop, letting them to use any software to show it. Its `no necessary a big bandwidth of Internet, it works fine with medium/low bandwidth, in this way the video and the sound communication are pretty good, considering this. Cons: I must take time to teach/familiarize previously for the students in the use of the platform, it is not an intuitive software. Pros: I have been using Blackboard Collaborate for the last 1.5 years and I can say that it does its job. It's easy to use, simple and it works as it was supposed to do. I like the fact that you can open multiple instances of the tool in case you want to watch archive recordings and pause them to continue at a later time. Cons: A few times the tools won't run. There are also times that there is a delay on sound and it's not clear what is the problem. Pros: Very user friendly. Easy to be navigated by students and faculty. Smooth integration with publisher's materials. Cons: If they can add a delete button on announcements. I copy announcements from previous semester and I would like to see that you can select several announcements to be deleted in one click. Pros: I am a part-time graduate student and took several online courses to save commute time. Blackboard Collaborate makes it easy to have a fully-engaged audience without being physically present. You can communicate with the instructor or other students via audio or by typing messages. And it would allow you to record the session so that the students who miss it can have access to it at a later time. Cons: You will need strong internet connection to make it work well. If the internet slows down, you may get kicked out of BB collaborate. It is not very intuitive and it may require some training before you know how to use it properly. Comments: Overall I love the experience of using Bb. Pros: Very convenient to use. I love the ability to connect virtually and also share the screen with the students. Students can also catch up on the lectures by watching the recorded sessions if they missed any lectures which I feel is extremely helpful. Blackboard Collaborate made online classes much more interactive. Pros: - Ability to break out into private groups while still remaining in the main session. - Chat system, audio, and video capabilities. - Able to draw on the screen during presentations. - Admin can restrict permissions or grant permissions for specific users. - Ability to test demo a room by yourself to practice beforehand. Cons: It could be laggy sometimes, but not too often (this may have also been due to users' internet speeds). Trying to fast-forward in the records sometimes caused the entire session to start over from the beginning. Overall: Interactive classes that could be recorded for replays, if needed. The ability to practice a presentation in a test demo room anytime, instead of going in blind on the day of the presentation. Note that I mainly used this software with my school previously. Pros: I enjoy the capabilities of this software. I used this platform while enrolled in school and we heavily relied on the grading, scheduling breakdown, and messaging. Cons: I believe adding a planner to the platform would greatly benefit students. Should investigate this option. Comments: I love that I can control who types, who can speak, and who can use the video function. I do wish that I could change the name of a student who logs in. If they log in with their name spelled incorrectly, they have to log out and log back in, whereas in our old software (Elluminate!) I could edit participant names. Pros: Blackboard Collaborate makes it simple for me to attend online meetings and meet virtually with my students across the state of Florida. I can easily upload PowerPoint slides, play videos, and distribute files. Cons: The Exception Errors are pretty common - sometimes I get booted out or my software freezes. It seems like the higher the attendance, the more likely these errors are. I used BlackBoard as a student. Pros: This software allowed me to register for classes, register for graduation, view my grades, and access online courses all in one place. Cons: I think the software system should develop an app for IOS and android that allows students to be notified when a class opens up. Pros: I like that Blackboard Collaborate allows users to access the meetings via desktop, laptop, and mobile device. I also like that users can create their own rooms and breakout rooms within the main session. Cons: I don't like that users who access the meetings from mobile device have limited abilities to use the tools within the session. I feel as though a mobile device would make it easier to use the whiteboard tools and options, but they are completely shut down for participants who attend via a mobile device. Recommendations to other buyers: Blackboard Collaborate has many good features, including sharing PowerPoint Presentation, Web tours, videos, etc. It is outstanding when on a laptop or desktop, but it is only average on a mobile device. Use blackboard as a grad student. Pros: The overall quality, ease of use, features & functionality of blackboard make it a great software for college students and college campuses to invest in. Cons: BlackBoard apps should have a feature that allows students to be notified of financial aid reimbursement. Pros: I like that this is already a tool in Blackboard and that I don't have to go outside of the LMS to hold a video conference. This saves us time and money so we don't have to buy or train on an outside tool. Cons: I don't like that it only works well in Chrome. Also, you have to have a fast computer to hold a session. I was using a dated computer at one point and it kept dropping the session. But if you can remember to remind users to only use Chrome and if you have a fast computer, you'll be able to use this. Overall: Once my computer was upgraded, I had an 7 year old computer previously, all of my issues went away. Pros: I like the user friendliness, especially as it relates to upcoming assignments on the front page of the application. Cons: I dislike how cluttered it can get when you delve deep into some of the modules within the application. Pros: Easy to use and very beneficial. I used it for many online college courses. It keeps everything organized and allows people to collaborate. Cons: It can be difficult to navigate at first. I also think it could benefit from being more user friendly. Pros: The ability to join forces online with fellow groups members on a specific project or task, and work together within the platform to finish our tasks by the deadline. Cons: Video wouldn't always work, seemed like the IT department was the place to go for all issues and they didn't always have a full handle on how portions of Blackboard itself worked. Pros: Blackboard is easy to use for students and professor, it's nice to have all of our classes and information located on one platform. Pros: The new Blackboard Collaborate is great! I've used it as both a student and as a potential professor, as I am a certified online instructor. When I was obtaining my certification, I was trained in how to use Blackboard Collaborate and create/open sessions. We did a few tests and it was a lot better than the old version back when I was just an undergraduate student taking the occasional online course. Cons: There wasn't really much negative about it. The old Blackboard Collaborate needed improvement, but the new version is that improvement. It looks better, functions better, and operates more efficiently. I use this software daily. It is rather simplistic to use however my institution will be switching. Pros: I like the wide variety of how you can set up things and communicate with fellow students and staff. Cons: I think what I least like is we tend to have errors with this system, where things time out and/or data is lost and has to be resubmitted. Pros: It functioned. Used when I attended ACC and the software always worked as expected. It was a reliable platform as I remember. Cons: None come to mind. I remember it being useable on all my computers and I could log on to do homework without issues. Overall: As a student, I use blackboard daily for my courses, I find it simple to navigate, however sometimes the layout of the documents and work is confusing and often times not aesthetically pleasing. Pros: I like Blackboard because it's made going to school online, for me, much more personal. I love that I can access it from my phone too. Cons: Sometimes, when there are too many students on at the same time, it will freeze or stop. It gets really good irritating. Pros: The software creates one simple place to organize many classroom tools-such as: syllabus, discussions, grades, virtual classroom/chat room, etc. The software is user friendly. Cons: The software occasionally has glitches or lags during virtual classes. Students and instructors have trouble logging in and staying in. Very good way to collaborate with people in your business. Pros: I like the way the software is organized. It is easy to collaborate with others and make sure everyone is on the same page. Everyone can see the calendar and add events to it, allowing for easy communication. Cons: Although it is an easy way to collaborate, I feel that there are software options that are easier to use. Very creative way to train! Comments: Good to go app. Cons: It has a limitations especially in power point, when they lose connectivity it has tendecy to kick out participants during the session. Pros: I have used this blackboard learn and BB collaborate during my grad school at George Washington University. The Collaborate was great tool for distance students and remote sessions. We were able to easily view the professor, the lecture slides, annotations, chat with other attendees live and have the session recorded. With all these features, the software was smooth and glitch free. Cons: Blackboard is not for free. The university has to pay per student license on yearly basis. Blackboard in return would provide professional software support, patches and upgrades. Overall: Great remote classroom experience.